MenEngage (2015). Gender Equality and the Work with Men and Boys: Contributions to the Post-2015 Agenda from MenEngage. MenEngage, Sonke Gender Justice, Promundo, Rutgers WPF. MenEngage recognizes that the Post-2015 Agenda must embrace a human rights-based approach, as championed by the International Conference on Population and Development (ICPD), and believes that meaningful citizen participation should be built into every stage of the Post-2015 process, from developing the agenda, to the implementation, all the way through the monitoring and evaluation. MenEngage stands with UN Women and women’s rights NGOs in advocating for a stand-alone goal on gender equality and women’s empowerment in the Post-2015 Development Agenda. Gender equality and women’s and girls’ rights must be a cross-cutting issue in all other future development goals. To achieve gender equality it is essential to work with men and boys given that women’s and men’s lives are intertwined. Men have not only a responsibility to contribute to transforming oppressive gender systems, they will benefit from it as well. 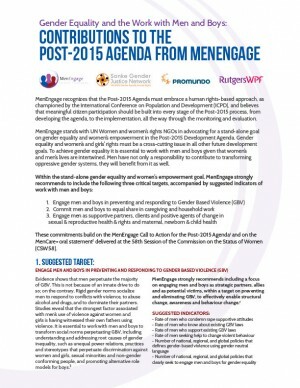 These commitments build on the MenEngage Call to Action for the Post-2015 Agenda and on the MenCare+ oral statement delivered at the 58th Session of the Commission on the Status of Women (CSW58).